Get Updates by SMS Text! Vacation Fun for the Whole Family! Don’t wait! – Reserve your spot now for the best summer rates! Located in the heart of Wisconsin Dells right on beautiful Lake Delton, Delton Oaks Resort offers a classic Wisconsin “family vacation on the lake” experience with available cabins, villas, and studio condos offering real home-style comforts, amenitites, and extra space for family gatherings, reunions, and small groups. With a private sandy beach, dock, and pontoon float, you can splash around, swim, and boat to your heart’s content! Fire pits and barbecue grills are available for use by registered guests. 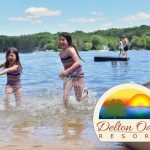 From s’mores to oars, Delton Oaks Resort has something for everyone! Family owned and operated, we work hard every day to provide the best vacation experience for your family – the kind of family tradition that will make you and your family want to return for the good times and memories, year after year! Sign Up For Text Message Updates! 10 Teams Compete! - Taco Tasting for Spectators! $99 Room Special - Free Taco Tasting Coupons!